The California Tahoe Conservancy authorized $1,000,000 dollars in grant money for improvements to the Homewood and Dollar Creek bike trails. Larry Sevison, Chairman of the Conservancy Board said the trails, "provide spectacular recreational opportunities, connect our communities, and improve the environment and economy of the Basin." 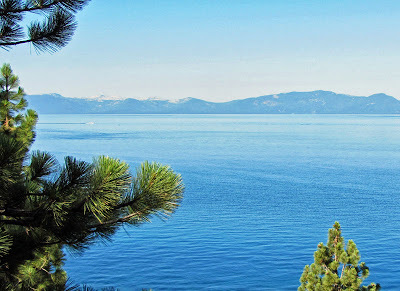 Lake Tahoe near Sand Harbor. The Tahoe City Public Utility District was granted $500,000 to build a stretch of protected bike trail along Hwy. 89 in Homewoood. The Homewood Bike Trail Project will completed the bike trail network from Tahoe City to Sugar Pine State Park. Construction is expected to begin in May of 2014 and should be completed by October of 014. Placer County was awarded a $500,000 grant to acquire a parcel for use in the Dollar Creek Shared-Use Trail. The Dollar Creek Trail will be a 2.2 mile trail that extends the Tahoe City Public Utility District bikeway that ends at the crest of Dollar Hill. The long-term plan is to complete the trail all the way to Kings Beach.